Perry, a member of the Worship Collective, released his first single “October” on Spotify in October. Perry played at the LaHaye Event Space on Nov. 28 and plans to continue recording after graduating college. The LaHaye Event Space was flooded with fog Thursday, Nov. 28, as the stage was set for singer-songwriter Grayson Perry to share his heart and talents with the crowd at a Student Activities-hosted concert. The room was lit dramatically as the smell of Chik-Fil-A and bright pangs of laughter dissipated the usual tension of pre-show prep. The community between the musicians was evident. The atmosphere reflected the prevalent mindset Perry wants to convey to his audience through his music — hope. “I hope that people can see that whether the circumstances in their life are good or bad, God can always bring good out of it,” Perry said. It was evident all his life that Perry had an affinity for music. Taking piano lessons from the early age of three, writing his first songs at age seven and joining the Liberty Worship Collective as an adult, Perry has deeply involved himself in music. Perry cites many singer songwriters as his inspirations, including Andrew Belle, Michael Bublé, Jason Mraz and Third Day. 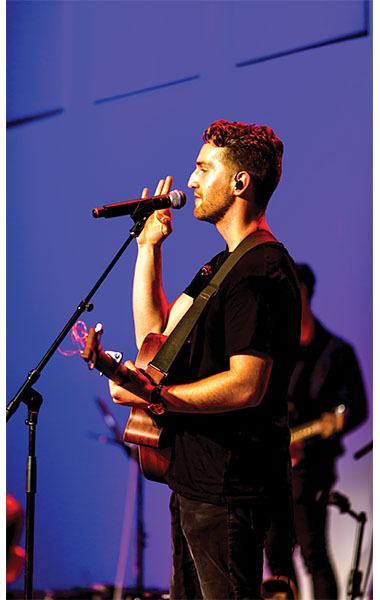 Playing every week with the Worship Collective and having his music available on Spotify has also elevated Perry’s musical career, with his first single, “October,” released this past October. When describing his music, Perry is reluctant to put a label on it, as the sound is an amalgamation of many musical elements. Perry has plans to release an EP this January, and is already planning another beyond that, but despite any success he has in his music, he wants to stay true to his ideals and faith in his performance. “I don’t want to get into an industry that tells you that you have to be a certain way to sell because that’s not who I am,” Perry said. This shows in his songwriting, as his Christianity seeps into everything he produces. The night began with opening act Salvatore DeMare, a solo acoustic act with occasional accompaniment on the Cajon. DeMare’s setlist was primarily covers spanning from the 90s to the 2000s, including offerings from Radiohead and The Cure. Looking to the future, Perry aims to graduate with a business degree. He wants to pursue his music, although not on tour as of now. “I don’t necessarily want to pursue a music career as in the touring life, but I’d be totally open to recording things,” Perry said. Perry said his experiences, both good and bad, have and will continue to shape his music in the years to come. It was a great performance. Keep up the good work Grayson.